Friday, like everyone, I was following the unfolding intensity of the predicted nor’easter. The meteorologists and newscasters had told us for days – this one was going to be big and impact the entire East Coast of the state, and the flooding would be astronomical across three high tides. There would be damage. There would be flooding. And very likely, there would be power outages. All of that came to pass. On a personal note, there are few things as disconcerting as turning on WBZ 1030 news radio, and the top story is the breaking news of the flooding and devastation not only in Quincy, where I work and my family lives, with a reporter calling in from the street three blocks from my family. Thankfully, with the exception of being cut off from the rest of Quincy due to the flooding, and a few days without electricity, my family is fine. I was greatly worried about them the entire weekend, and very grateful for the ability to call them by cell phone and stay in touch. But it all got me thinking. Speaking only for myself I am physically and emotionally drained from the weekend. And I live in Foxboro. Here, we all experienced about 72 hours give or take without electricity. The wind was ferocious at times, with the trees swinging back and forth ominously, and threateningly. Many trees lost that fight and there were countless pictures posted across social media of trees down in Foxboro. There was damage and disruption. People were displaced and most of lost food, and many needed to leave our homes or “shelter in place” in a cold home in the dark. I had some thoughts I wanted to share, in no real particular order, just in a contemplative mood today. To National Grid – you’ve come a long way. This is not 2011 when National Grid failed Foxboro and we TWICE had six days without electricity here in town. National Grid has made tremendous strides along with the town since then, making significant improvements, keeping trees trimmed, wires repaired, and being far more proactive BEFORE and during storms. I am grateful that they were able to get our power restored relatively quickly despite the intensity of this nor’easter. Also, I’d like to think National Grid for the timely updates on social media and on their website with the specific areas of outages, and honest estimates of repair time. And to everyone in a bucket truck in the wind and rain cutting through trees and working on live power lines — God bless you for what you do, and stay safe. Your work is much appreciated. That being said, speaking only for myself, and this is NO reflection National Grid, we need to re-evaluate the future of power in Foxboro. While 72 hours without power isn’t the end of the world, but in winter it means a home becomes uninhabitably cold due to lack of electricity. What about the elderly? What about the sick? What about people on lifesaving medical equipment? The people with pets who cannot survive the cold? People with little children? A loss of power for three days is an inconvenience for some, it can be life-and-death for others. For these reasons and many others evidenced in this storm and others, I really think it’s time that this town as an entity appoint some sort of committee to evaluate our electrical grid system and make recommendations for improving it over the next ten years. This is not a quick fix and this is not something that will have universal approval. It will cost a tremendous amount of money. And I don’t know what the correct solution is. What I do know is that if we are getting a storm here in Foxboro, if it is going to be very windy here in Foxboro, there is a more than reasonable chance the electricity is going to go out. Mansfield did not lose power. Towns adjacent to Foxboro did not lose power. There are various reasons for this – they have their own systems, perhaps their systems are better than ours, I don’t know. What I do know is it is time for an evaluation — Some sort of exploratory committee that looks at the history of power outages and service in the town and comes up with recommendations for how we go forward – not JUST until the next snowstorm, but five, 10, and 25 years from now. It begins with a research and recommendations. Again, I am not pointing any fingers, I am not blaming anyone, but it certainly seems that Foxboro loses power more frequently than adjoining towns. It seems, to me, that our existing electrical infrastructure is no longer adequate for 21st century life and technology in the town of 17,000+ people with a 20-25% senior population and devastating weather conditions expected in this area of the country. I’m suggesting it may be a good idea for town leadership to explore the idea of forming a committee that meets periodically, and reports back periodically about ideas for the future. Discuss. On the subject of long-term outages, Puerto Rico. They have been without power for almost 6 months. Six months. 3 million American citizens in an American territory and judging by the video I have seen on TV, it’s horrific. How are they doing? Do we even think about them? What can WE do to help them? Closer to home, I would just to ask that you keep the victims in other towns – the ones who have lost so much – not only in your thoughts and prayers, but if you can HELP them, please do so. I would like to publicly thank the town of Foxboro’s manager Bill Keegan for continuing to send out updates on social media as to what was happening around town. It’s easy to feel cut off from the world when the power is out. Mr. Keegan, your updates were timely and much appreciated and helped us keep up to date with what was happening. Thank you all at Public Safety for opening the McGinty Room to let us get warm, charge our phones, and enjoy coffee and delicious soup made by an awesome Foxboro resident. It was a welcome respite just to chat with friends and strangers and to commiserate on our shared misery and also reflect on how lucky we are. Likewise, thank you to all the volunteers who opened and staffed the Taylor School and stayed up all night to provide comfort and shelter for those who needed it – you’re doing God’s work! 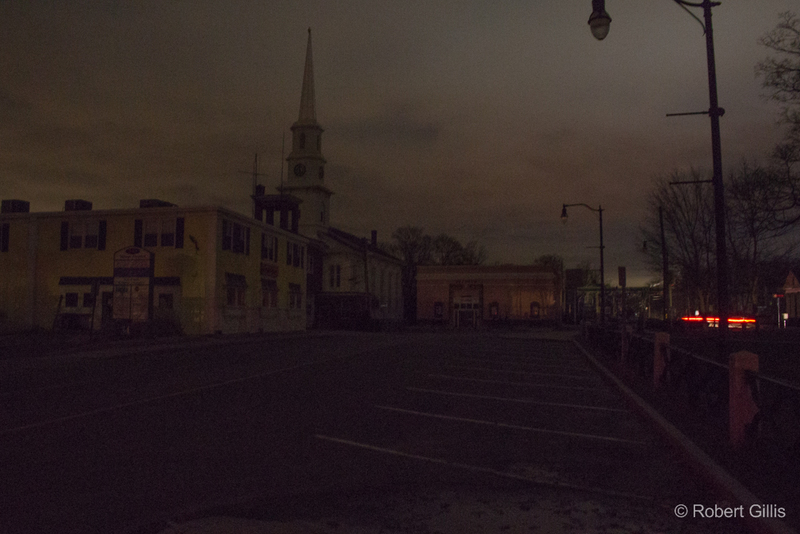 I went out Saturday night around 10 to Foxboro Common, which was engulfed in eerie darkness – it was SO strange. TOO quiet. It looked like the end of the world. It looked WRONG – where was the light… BUT — but there was also a quiet poetry and beauty to it – I stood there for some time, marveling at the siight of the Common and surrounding streets lit only by passing cars and otherwise shrouded in night and thought this is what Foxboro must have looked like a century ago before street lights and ubiquitous signs and lit windows. There was something nice about it. I was glad to witness that moment, but do NOT want to make it a regular thing. To everyone, once again, thanks to team work, good leadership and organization, and COMMUNITY and some love and a LOT of patience we made it through. We’re not there yet – a power outage is still a real crisis and I believe we can do better on several fronts, but each storm is also a learning exercise for us personally and as a community. But this time around, I think we did pretty well, and speaking only for myself, I’m tired, I’m drained, but I am also, profoundly GRATEFUL. We once again dodged a bullet, once again rallied to help each other, and once again showed we are getting better all the time. Zen and Art of Writing Op/Eds – I still have a lot to say! → ← Slow News Day, Random Thoughts, Early 2018 Edition!